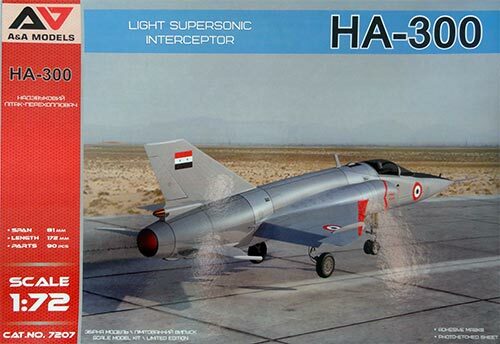 In the early 1960s Egyptian president Nasser wanted a supersonic fighter made in his own country. Earlier at the Spanish company Hispano Aviacion the German Professor Willy Messerschmitt, designer of the famous WWII ME-262 jet, was involved in the design of several aircraft. 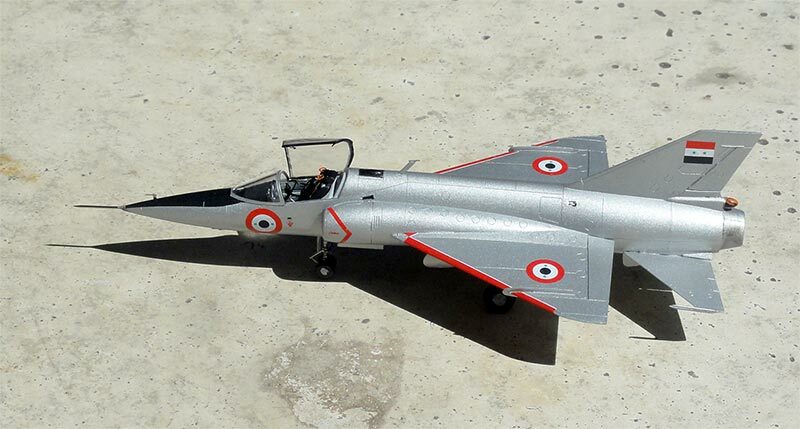 One such aircraft was the Hispano HA-200 Saeta which was also license manufactured by the Egyptian Helwan company. 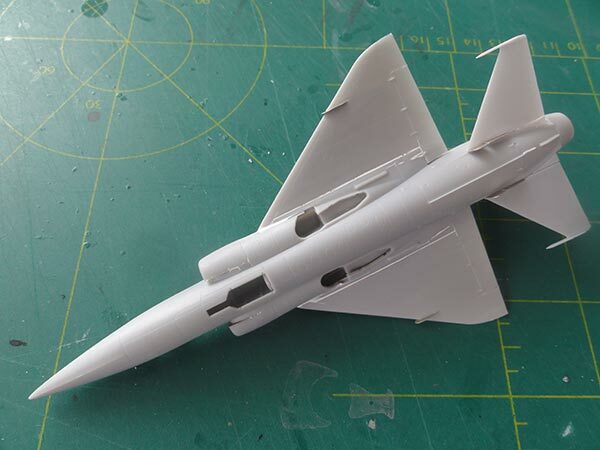 Professor Messerschmitt had also made a design for a small supersonic fighter for the Spanish air force under Franco dictatorship. 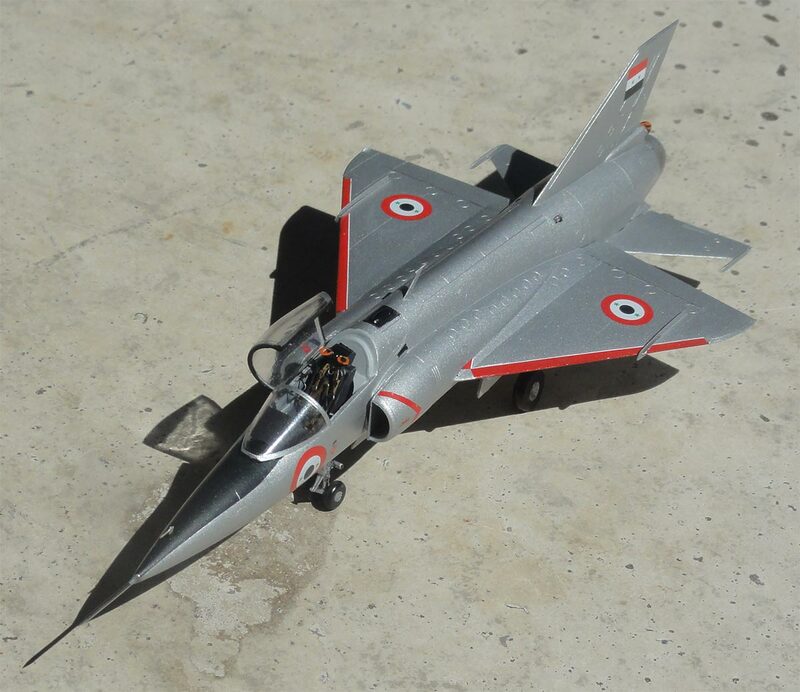 (In those days, smaller fighter designs such as the Folland Gnat were not uncommon). 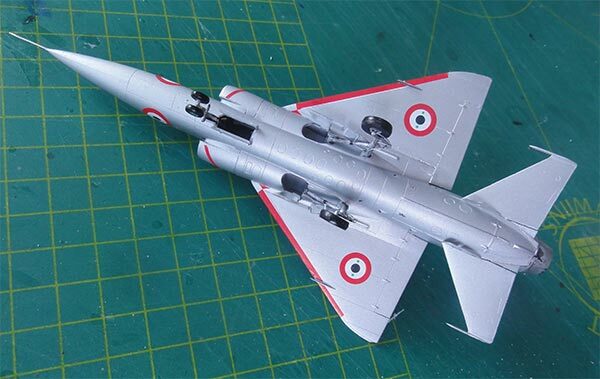 This supersonic fighter designated HA-300 featured a highly swept wing of 57.5 degrees with an extremely small wing-chord ratio (t/c) of only 3 % and wing span of only 5.84 m.
Spain stopped with the project and in 1960, the Egyptian government bought the design for the HA-300. 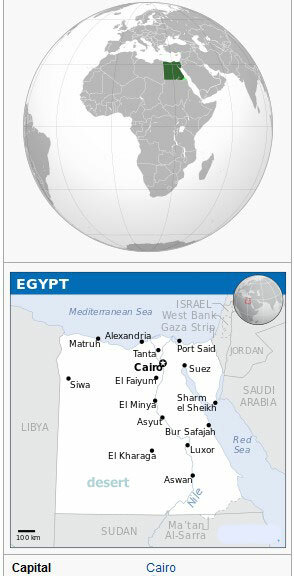 Helwan continued at the site located at the Hulwan airbase, southeast of Cairo. 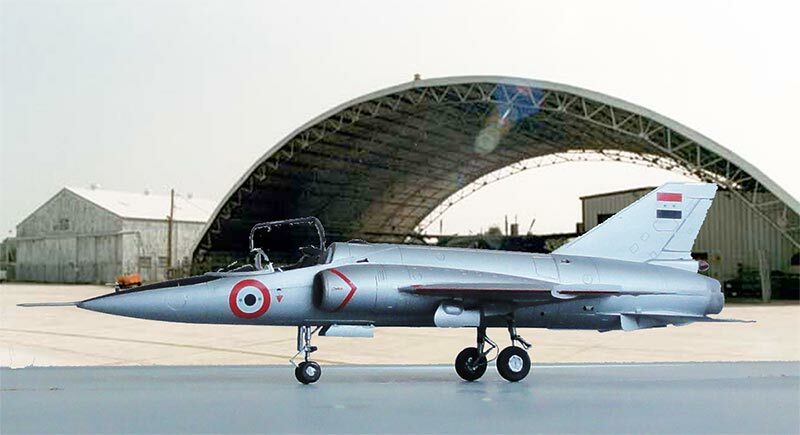 Two prototypes were made and the Indian test pilot Kapil Bhargava who was also involved in India's Hindustan HF-24 Marut fighter project (were Kurt Tank assisted) was contracted to fly it. But the German engineers on site did not support this pilot. Nevertheless, Bhargava's chance came to shown it while taxiing on the ground during a parade in July 1963. 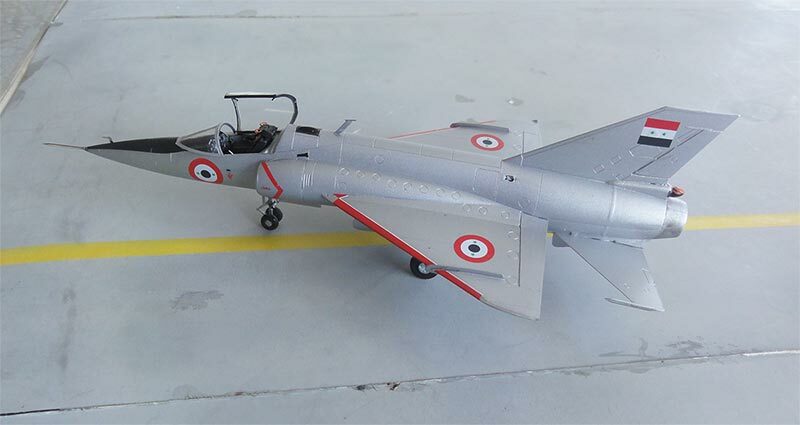 The test pilot had meanwhile studied some design features and indicated that many items were dangerous such as leaking fuel tanks and some of the controls and not compliant to the AP-970 requirements. He refused to fly before this issues were solved to the dismay of Professor Messerschmitt. After fierce debates eventually improvements were made. Two prototypes were ready and HA-300 "V-1" first flew March 7, 1964 without any problem. With some slight additional adjustments it was now a very well flying jet fitted with a Bristol Orpheus 703 engine. 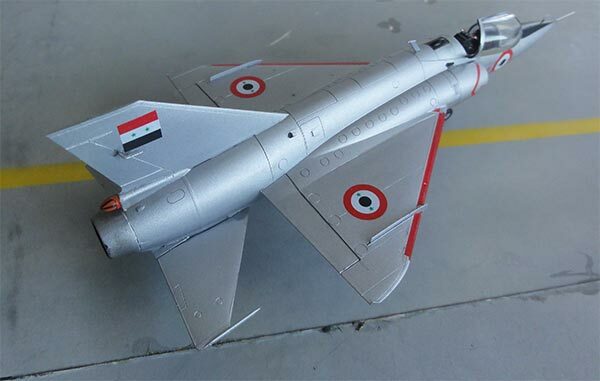 Work was in progress as well by Austrian Brandner at Helwan to develop an Egyptian "E-300" engine. Four HA-300 test aircraft were completed but only V-1 and V-2 flew. The 1967 Six Day war in the Middle East led to tensions and in 1969 the Helwan HA-300 project stopped and Brandner went to the Soviet Union. (The E-300 engine design was used at Hindustan India to be fitted later on in their HF-24 Marut). Almost 30 years later in 1999 the German aircraft company DASA bought the surviving Helwan HA-300 "V-1" prototype. It was restored during 4 years and put on display in the Deutsches Museum at the Flugwerft in Oberschleissheim. 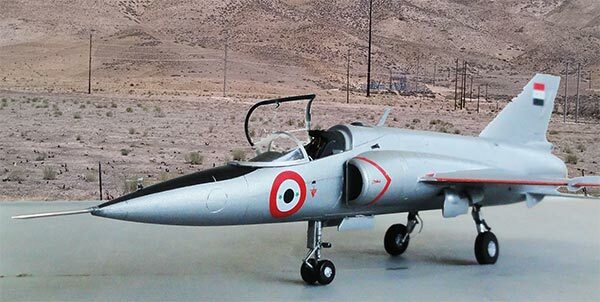 The new kit brand A&A Models released a small 1/72 kit #7207 of the Helwan HA-300 in 2018. It is a very well engineered and detailed kit with about 68 parts, an etched metal fret and paint masks. A closed and open canopy is provided. 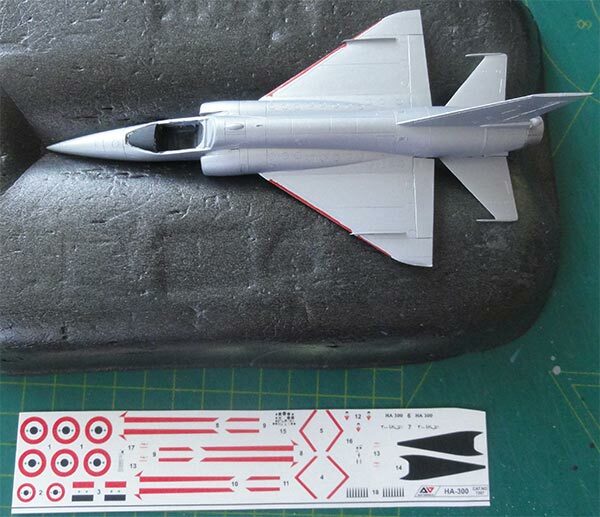 The instructions are very well executed as well and a very nice decal sheet provides markings in 2 variations with an aluminium scheme and including the scheme at the Deutsches Museum at Flugwerft Schleissheim. It is clear that the real aircraft in the Deutsches Museum was inspected and measured by A&A models. The kit is very good and accurate. The ejection seat is well detailed and all gear bays have ribs and details as well. 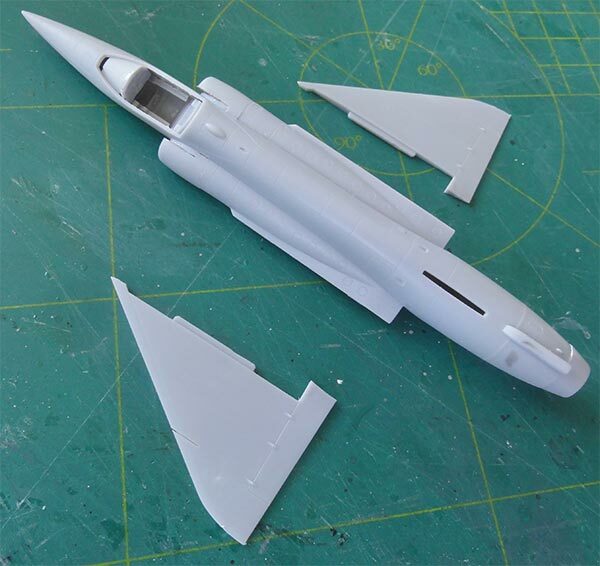 Hardly any filler is required, some at the lower wing root joints and the small gaps in the interior and wheel bays were closed up with white glue. 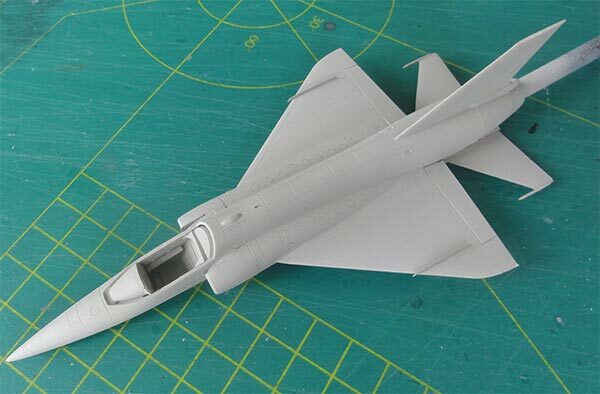 The lower fuselage shows a fence for which I think also an etched metal part #Z20 is provided. The overall got a base grey with Revell 75 "steingrau" aqua acrylic as primer to check for any errors which were not found. This is really a very nice "straight out of the box" built. The overall paint scheme is aluminium (so not bare metal). 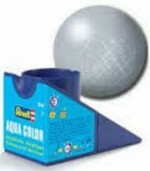 Revell aqua 99 aluminium was airbrushed. The scheme for the "V-1" as of March 1964 was picked. Decalling was done next. 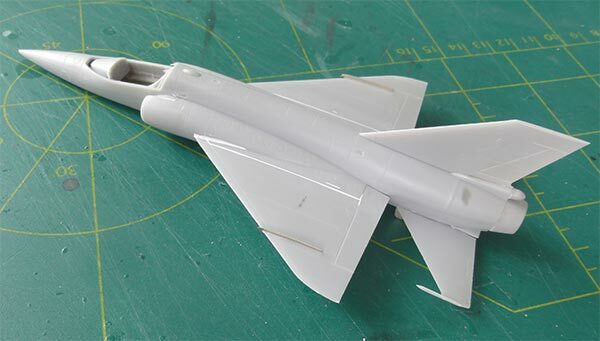 but I hand painted the wing leading edges red before applying the red stripes "8". 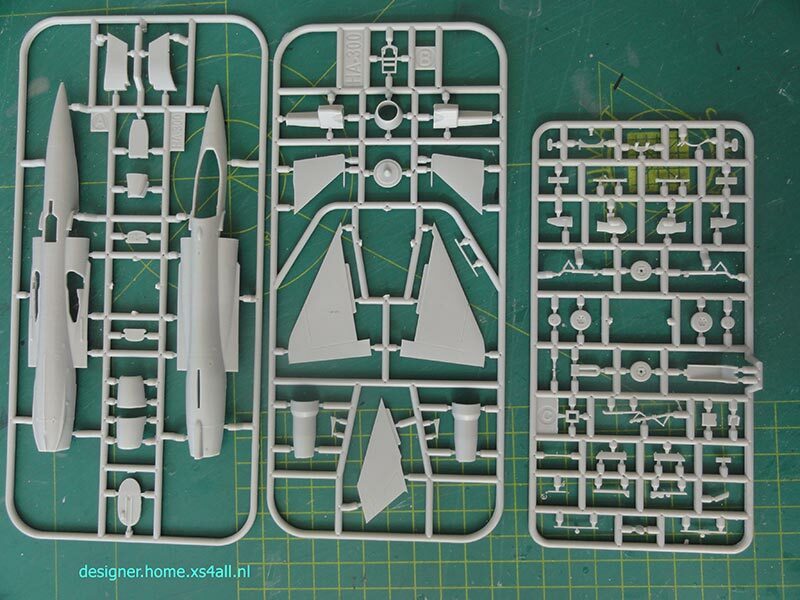 You get some spare decals for these, and masks are also provided for the canopy but also tiny spots like the wheel hubs. Very nice! After decalling the model was completed. 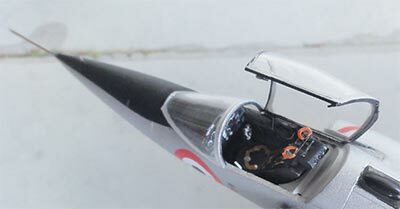 The gear bay interiors were painted light grey and the small landing gears fitted. One wheel had a sink mark that was quickly filled. I also added a few hydraulic brake wires onto the gear legs. The anti-glare panel is a decal and a small pitot installed on this panel. The pitot is in the kit but not indicated in the instructions. Anti-collision lights were painted and the model got a gloss coat of varnish airbrushing Johnson Future / Pledge. 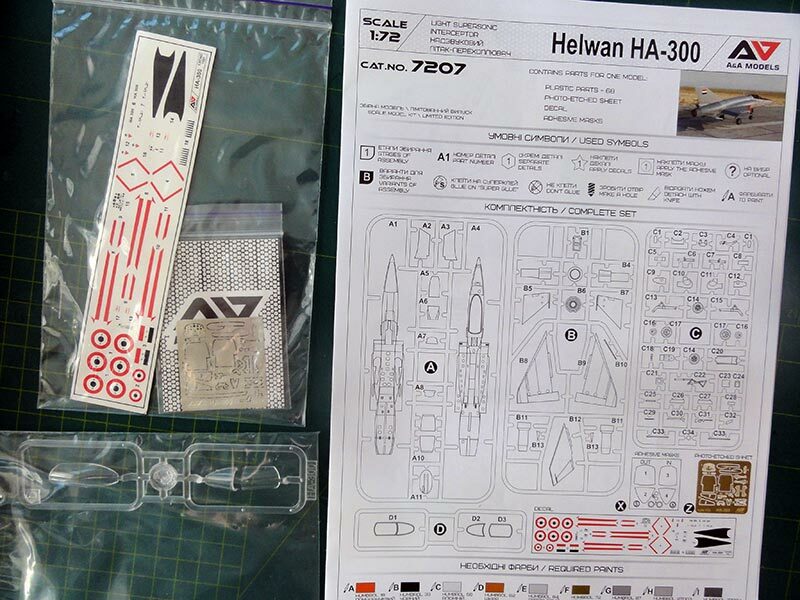 The canopy was set in place in an open position and that completed a very nice and special model of the Helwan HA-300. A&A models have made an excellent kit and I have also purchased their VJ-101 kit.